San Diego is the largest metropolitan area in the United States and the traffic at San Diego International Airport exceeds 20 million passengers, serving more than 500 scheduled operations carrying about 50,000 passengers each day. San Diego International Airport took birth 90 years ago, named after Charles Lindbergh, who flight tested the Spirit of St. Louis before his historic 1927 transatlantic flight, the first-ever solo non-stop transatlantic flight from New York to Paris. The airport is owned and operated by San Diego County regional airport authority. 1 There are an endangered species that reside in grassy areas beside the runway. After they were included in the federal Endangered Species Act in 1970, the airport put a protection program in place that reduces vehicle speeds near nesting sites and restricts construction lighting at night. 2 San Diego International is the busiest single airport in the United States and third-busiest single runway in the world, behind Mumbai and London Gatwick. 3 The Peninsular Ranges standing strong and tough and skyscrapers of Downtown San Diego in close proximity to SAN international airport make it one of “the busiest, difficult single runway in the world. SAN offers a close proximity to many attractions because of its location that is just three miles from downtown San Diego. San Diego’s zoo is an attraction to millions of people each year who loves to adore penguins or wake up at sunrise to catch the famous waves at Cardiff beach. Serving over 20 million visitors in a year, no doubt SAN is one of the busiest airports in the USA. Although traffic is not as worse as that of Los Angeles or Orange County, traveling days are always stressful and even a little traffic can two-fold the stress level. You can definitely lessen the stress level by reserving your ride with RapidShuttle 247 who is always eager to serve the transportation needs of the 100s thousands of travelers that come in and out of the San Diego Airport, 24 hours a day, 7 days a week. Prompt and efficient: With a range of professional door-to-door shuttle services, RapidShuttle 247 guarantees a prompt, convenient and fun riding experience with our friendly drivers. With more than 20 years of experience in the transportation industry, RapidShuttle 247 is proud to serve more than 15000 satisfied clients. We urge to serve more and more people with our cost-effective, efficient and prompt shuttle services. Higher the airport traffic higher will be the traffic at parking lots: When an airport serves more than 20 million passengers in a year, there is no doubt that parking lots remain occupied to most of its limit almost at any time of the day. You need to reach the airport on time but do not wish to waste time finding a place to park your car, then it is wise to opt for the services of RapidShuttle 247 who guarantees you to get there and back without hassle or worry. Be independent and go private: Your privacy and safety is the top most priority for us. Hence, we leave no stone unturned to satisfy both the needs of a traveler. No ride sharing means you will not have to depend on other travelers to be where you need to be on-time. Just proceed through the baggage claim area. 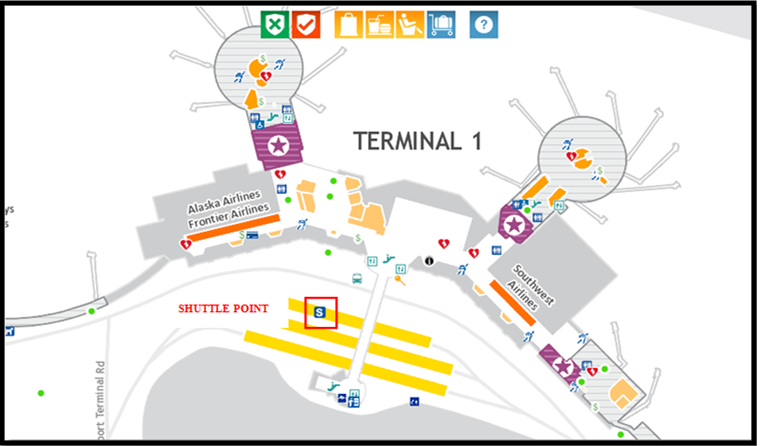 Once you gather your belongings, use the skywalk located near the center of the terminal to cross over Airport Terminal Road. Please contact our SAN Airport dispatch at +1 (888) 672-7438 and select option 2 or +1 (949) 667-2743 for further assistance. The SAN Airport dispatch will direct you to your RapidShuttle vehicle. 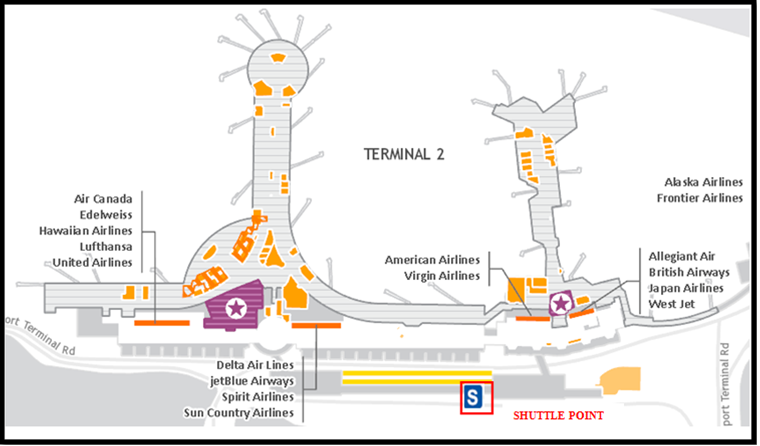 Once you gather your belongings, use the pedestrian crosswalk into the Terminal 2 lot to exit. Shared or direct rides to and from the airport. Book around-town service for non-airport destinations. Hourly service offers charters, available 24/7.